Moving your stuff to or from Iowa can be very stressful, especially if you’ve failed to plan it properly. 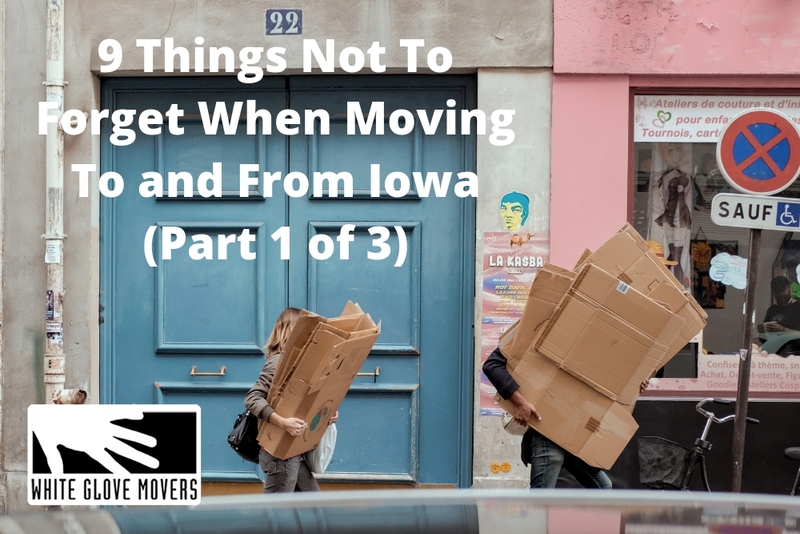 To avoid the confusion of your move and leaving yourself devastated because of unwanted property loss and broken home items, here are some things you should NEVER EVER forget when moving to or from Iowa. This may sound simple, but you’ll be surprised by how many homeowners have forgotten to do this basic principle. Their reason – they did things in a rush. Thus, it is important to have a checklist of your to-do list. This will ensure all that has to be done are properly taken care of, including labeling the boxes. Label items that contain fragile items. Group those that are used for the kitchen, bathroom, living room, bedroom, garage, and other places inside your new house. You’ll be surprised at how much time and effort this will bring you. Yes! We do understand that you want to save a couple of bucks. But that does not include the packing materials you will be using when moving to or from Iowa. You need to ensure that the boxes are strong enough for your contents, otherwise, it can simply collapse and leave your things scattered on the floor. Oh! but this means too many boxes for me to use, what should I do? Use all the needed boxes so you can quickly pack and unpack your items. If you do not know how many boxes you’ll need, just give White Gloves Movers a call. One of our staff will help you estimate the number of boxes you’ll need. Do you have any food that you wish to donate? We are also affiliated with Move For Hunger. We are happy to set aside your unopened non-perishable food items and donate it for them to use it in their local food pantry. Call us, today. This could be a bit tricky because one can easily argue that they need everything there is inside their house. But in reality, you really don’t need all the appliances when moving to your new house. You may have decided to buy a new sofa, bed, ornaments, curtains, bed-sheets, chairs and other furniture to match your new home. So what will you do with those unnecessary furniture? It is best to have a garage sale before you move. In this way, you can raise money for your new furniture and save on the amount of space you’ll need when moving out. Otherwise, you can always donate these items to charity and let them do the selling for you.